I had bookmarked Guy Fieri’s Chicken Tikka Masala recipe months ago with the intent to veganize it once the weather got a bit cooler. I’ve never had tikka masala before, but the concept sounded amazing to me: tons of tomato with intense and fragrant spices and rich coconut milk. So I put on my vegan thinking cap, rolled up my sleeves and enjoyed every minute of layering these components and flavors together to produce a dish that is colorful, tangy, a bit exotic and intensely spicy. This dish was so good that I not only ate this for dinner the day I made it, but also ate it for lunch at work for the next three days. This is one of those dishes that tastes great freshly made, but is even better the next day, after the flavors have had more time to mingle just a bit. First, slice and press one block of tofu very well. Then, make your tofu marinade by combining all of the marinade ingredients (except for the tofu) into a large glass pyrex dish. Then slice your pressed tofu any way you like, and place it into the marinade, flipping once to coat. Cover and place into the refrigerator for a few hours to overnight. When you are ready to make the dish, heat the oil and vegan butter in a medium-sized dutch oven over medium heat. Add in the onions and saute for about 4 minutes. Then add in the tomato paste and garam masala and stir to combine. Saute for another 4 minutes. Throw in the cinnamon stick. Now add in the canned tomatoes, vinegar and salt and stir. Allow to simmer for about 30 minutes over medium-low heat. After 30 minutes has passed, remove your tofu from the refrigerator. Preheat another skillet over medium heat. 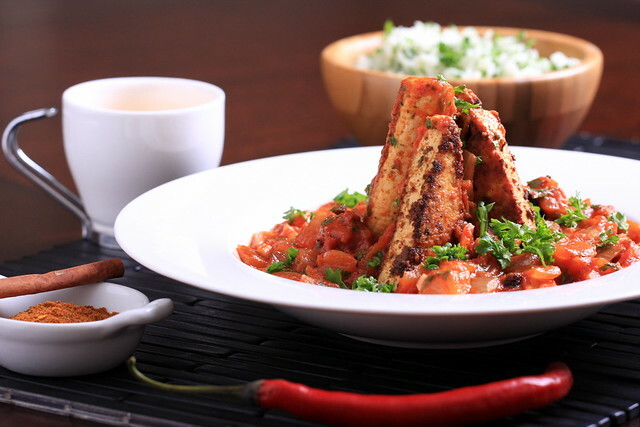 Remove the tofu from the mariande, tapping off any excess sauce and place onto the skillet. Reserve the leftover marinade. Saute on each side until golden brown, about 7 minutes each side. Return to your sauce and transfer any leftover marinade into your sauce using a rubber spatula. Stir to combine, remove from the heat, and stir in the fresh cilantro. 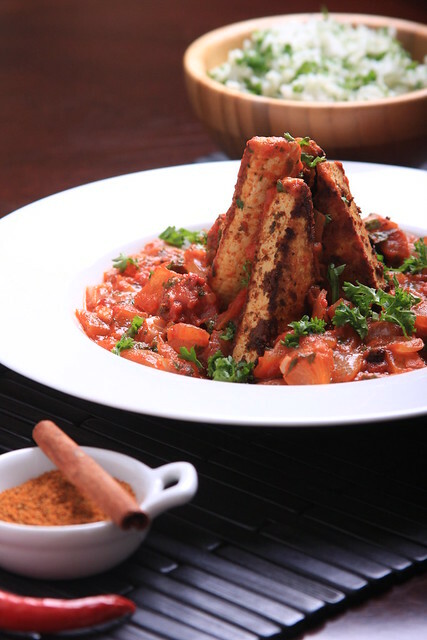 To serve, place the tofu onto a plate or bowl and spoon a generous amount of the sauce over the top. Sprinkle with extra fresh cilantro and serve with rice. i've never had tikka masala either, but it looks freakin amazing! i love all of the components and the idea of layering them. and i've never heard of garam masala cinnamon stick! i will have to keep a lookout for them. Thanks Caitlin! Blogger has been mangling my hard returns lately, and pulling ingredients onto one line, so this was actually two separate ingredients, which I have fixed above. But I would LOVE a garama masala cinnamon stick — now that would be a fragrant item! This looks (reads!) amazing. I'm definitely going to be making this. Thanks for experimenting with recipes and helping us make them vegan. Thank you! And thanks for visiting the blog! I've had that one bookmarked for while too! Thanks for veganizing it for me, lol. except i added a whole bunch of swiss chard instead of just half a cup of kale, it was pretty delish, but i'm interested in trying yours, which seems a lot richer! one question: does dried cilantro = ground coriander?? Richa always makes fabulous recipes, I am sure this one was great! I think that dried coriander is made from cilantro seeds, while dried cilantro is the leaf itself. I think either would work fine in the recipe. This looks delciously spicy! I've never made tikka either but now I want to! made this last night – totally, completely AMAZING! really complex and deep flavours, and it tasted like restaurant-quality tikka masala. i only had time to marinate my tofu for about 1.5 hours but it was still so buttery and delicious. i also left out the habanero because i didn't have any, and just added some chili powder instead. this is definitely on my favourites list for winter! oh, and i used about 0.5 tbsp of ground coriander in place of the dried cilantro – i remembered that for richa's tikka masala i couldn't find the dried fenugreek leaves she used, only had ground seeds, and she pointed out that the seeds are stronger in flavour so to use half. i figure the same probably applied to dried cilantro leaves vs. ground coriander seeds. Another award worthy recipe, Erin! The only change I made was adding a Tb. of Tumaric powder to the marinade. Absolutely delicious as much as it was an authentic tasting Indian meal- full of exotic flavor~ Served with naan. Vegan heaven! This looks amazing! One questions; do you think it would affect the dish too much if I used regular diced tomatoes in place of fire-roasted? Unfortunately I haven't been able to find fire-roasted tomatoes here in Australia. Thanks! Thank you! I think regular diced tomatoes would be fine here. I hope you enjoy! Opps, that should have been one question, not questions! Thanks, I look forward to trying the recipe this week! I am based in the UK and have never heard of and can not find Earth Balance, could I ask what this is and is there anything else I could use instead please? As far as the habanero goes, do I buy dried peppers and grind them up? We are super excited to make this!!! Hi Jill, you can use prepared habanero powder here, you can find it in most grocery spice sections — I hope you enjoy! So may I should have read the whole recipe so I could cut down on posts 🙂 Will one can of coconut milk equal 2 cups? Still super excited to make this!!! 2 cups is best, but most cans come in 13.66 oz, so you can probably get away with using just that, good luck!